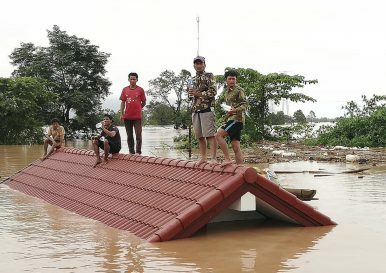 In this July 24, 2018, photo, villagers take refuge on a rooftop above flood waters from a collapsed dam in the Attapeu province of southeastern Laos. The cost-cutting and lack of oversight that led to the dam’s collapse plague other hydropower projects across the country. The Lao dam disaster in Attapeu province has cast a long, dark shadow of doubt about the safety standards and viability of dozens of other hydropower projects. This entirely preventable man-made catastrophe left 6,000 people homeless from floods and over 1,000 villagers unaccounted for. After the dam burst, the flood waters rushed from the Xe Pian river into the Sekong River, a major tributary of the Mekong River, near the border. The flood inundated many remote villages in Stung Treng province in Cambodia, leading to 5,000 villagers being evacuated in addition to the 13,000 people whose lives have been torn apart on the Lao side. The $1 billion Xe Pian-Xe Nam Noy dam project is a joint venture between South Korea’s SK Engineering & Construction Co., Thailand’s Ratchaburi Electricity Generating Holding Plc, Korea Western Power Co., and the Lao government. Ninety percent completed, it was due to start operations in 2019. The communist-led government in Laos has already completed 51 hydro-electric dams with another 46 under construction. Most of these projects began in the last 10 years, with the government arguing hydropower could lift landlocked Laos out of poverty. This frenzied rush to dam every river and tributary in pursuit of the landlocked government’s ambition to become “the battery of Asia,” without sufficient safeguards and standards in place, is the prime cause of this hydropower disaster, according to international specialists. Good governance is in very short supply in Laos, a secretive one-party communist state that shares little information with its population. Neither the government nor the hydropower companies engage in any consultations with the local communities about their hydropower projects. There is no early warning system for villagers in the event of potential danger or the imminent collapse of the dam. After this disaster, many Lao people are angry. Many have voiced criticism on social media, exceedingly rare in a country where even civil society development activists — let alone dissidents — have been abducted by intelligence agencies and “disappeared.” The best-known case was the abduction of Sombath Somphone, which led to the silencing of alternative voices in Laos. The Lao authorities, afraid of losing any remaining shred of legitimacy, are now scrambling to salvage some respect with a belated recognition on August 2 that the disaster was indeed man-made – and the victims must be paid compensation. Lao Deputy Prime Minister Sonexay Siphandone said the disaster was not caused by natural events, so the compensation package should be more than was usually awarded. “The flood was caused by a fracture in the dam,” he told a meeting of the National Ad Hoc Committee, which is in charge of dealing with the aftermath of the disaster. Attention is increasingly focused on the dam-builder, South Korea’s SK Engineering & Construction company, who clearly failed to provide a sufficiently resilient construction fit for purpose capable of protecting the local population. Long before this dam was built, Baird co-authored an Environmental Impact Assessment (EIA) on Fisheries. Among its recommendations: “Considering its important and relatively intact natural resources in fishes as well as in forests, mammals, birds and other organisms, we recommend that plans to dam and divert the upper Xe Pian be dropped from the Xe Nam Noy-Xe Pian project. Only in this way can the fisheries, wildlife and village resources of the area be protected and preserved for future generations.” Sadly, the Lao authorities ignored the EIA. As a consequence, some 11,000 people, who first lost their river biodiversity when the Xe Pian-Xe Nam Noy dam was built, have suffered another devastating blow to their livelihoods with the loss of their homes. These villagers are now forced into dependency on international aid and relief. And that’s not even mentioning the devastating loss of human lives. The deputy secretary of Attapeu’s provincial committee, Meenaporn Chaichompoo, has admitted that “we can’t find 1,126 people.” Many of the bodies have already been buried in deep mud, with others swept away by the torrents. Lao Prime Minister Thongloun Sisoulith admitted it was the worst disaster faced by the small Southeast Asian country in decades. It is clear the Lao government fears the anger of local people, and is trying to head off the fury by making it known special compensation will be paid in recognition of the structural defects of the dam. This gathering concern reflects on the credibility of a hydropower program that has long been criticized as increasing the poverty of the poor farmers. Dams have caused a massive loss of fish numbers, undermining food security. Dams also block sediment flows, undermining soil fertility and crop production downriver. The rush to build dams has meant too much haste and too few safety checks; costs are cut by settling for poor quality design and little oversight. This gross negligence does not only apply to this one case. Much bigger dams — built with the same haste — are about to be unleashed on unsuspecting populations. The highly controversial first dam on the lower Mekong in Laos, the $3.8 billion Xayaburi dam with 1,285 MW generation, is scheduled to be completed in 2019. Laos has pushed ahead with the dam in defiance of a loud chorus of opposition in 2011-12 from riverine communities in Cambodia, Thailand, and Vietnam. The dam was also strongly criticized by fisheries experts and other Mekong specialists. Does the Xayaburi dam meet the professional standards of independent review and oversight of construction necessary to make the dam safe and environmentally acceptable? Meng, who is a hydropower consultant to WWF as well as an engineering professor, concluded in a 2015 assessment that “years into construction, the Xayaburi developer is trying to cut costs by considering scrapping sediment flushing conduits and tinkering with the fish passing measures. While the structural modifications are driven by the objective to cut costs, they are still based on guesses and assumptions drawn from experiences from European rivers” — at odds with the more complex and vastly greater number of fish species on a tropical river. It is clear the dam will not be safe for fish. It may not be safe for human beings either. In addition to the Xayaburi dam, a series of Chinese dams now under construction along the river Nam Ou, and plans to build three more Mekong dams in Laos, all need to be subject to independent safety and impact reviews. China already has a long history of dam disasters, including the worst dam disaster in history, which killed 171,000 and displaced 11 million in 1975. In the wake of this tragedy, is the Lao government willing to roll back on its flagship hydropower policy of “rapidly dam every river”? Or will it shrug off all the consequences of substandard construction, poor safety, and devastating environmental impacts? Given Laos’ indebtedness to Chinese aid and investment, a wholesale change appears to be an unlikely scenario. But if Korean and Chinese dam-builders are unwilling to spend extra millions to guarantee build more resilient dams and accept international monitoring, then we can sadly expect more hydropower disasters in the next few years. Tom Fawthrop is the director of two films about the damming of the Mekong, including the documentary “Killing the Mekong Dam by Dam” released by Eureka Films 2017 He has also extensively reported on the Mekong for the Guardian, the Economist and other international media.